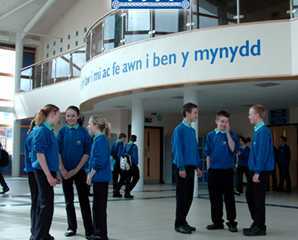 Ysgol Gyfun Bro Morgannwg is a Welsh-medium comprehensive school for the whole community of the Vale of Glamorgan. The school’s motto “Dyro dy law i mi ac fe awn i ben y mynydd” (Give me your hand and we will go to the mountain top) summarises their aim to ensure that each pupil reaches the summit of his or her potential with the help of dedicated teachers. Mind Mapping plays an important part of this motto as it is instrumental in helping the school achieve its aims for pupils. iMindMap is used at Ysgol Gyfun Bro Morgannwg in the teaching of Year 7 – 13 pupils (age 11 – 18) across the board for all subjects and for all abilities. Time management and forward planning are essential skills needed by my students. iMindMap is a key facilitator for this, and enables my pupils to keep on track with the syllabus. My GCSE IT students take part in the ‘DIDA’ course which is essentially a two year practical project. They are issuedwith a project brief in September, which they turn into a Mind Map to organise all the tasks they need to complete the project successfully. This initial stage of planning is extremely important because the students are able to turn their Mind Map into a time plan for the busy two years ahead of them. This preliminary planning is imperative to the success of the project, which my students would find far more difficult to achieve without iMindMap to focus their minds and structure their thoughts. iMindMap provides the students with a full and clear picture of what they need to get done, highlighting priorities and using images that are personal to them to provide meaning. It’s not just the IT department that use iMindMap at our school. The Languages faculty, including Welsh and German, plus the History department all use iMindMap when collecting ideas or preparing essays. iMindMap helps the students map out the relevant details and better organise and connect their ideas. I know the use of colour and images in iMindMap are particularly appealing to the Arts department who also enjoy the many benefits of using the software. iMindMap facilitates teachers when explaining work as they can pictorially represent a lesson plan, while for students it encourages freedom of expression when planning their work. iMindMap has proved a useful tool for both students and teachers. My colleagues are keen adopters of the software and use it to prepare lesson plans, saving them valuable time. Mind Maps can also be used in the classroom as an active and collaborative learning tool that allows us teachers to move beyond the traditional ‘chalk and talk’ style of teaching. We have recently won the prestigious Becta IT Excellence Award for Best Whole School in Wales, 2009. These awards aim to identify and reward whole school excellence in IT and reward those organisations who support school improvement with IT. During the Becta inspection we demonstrated the use of iMindMap within the school to the judges, who were clearly impressed with the benefits the software delivers to my pupils and colleagues alike. Excitingly, I have now won the BECTA award for Next Generation Learning in Wales for my teaching ability and innovative use of IT, of which iMindMap is a fundamental part in getting pupils engaged and interested in learning. iMindMap is a creative and easy to use tool that harnesses the benefits of Mind Mapping techniques for teaching and learning across the curriculum. Additionally, it is the only Mind Mapping product officially endorsed by Tony Buzan (the inventor of Mind Maps) that effectively duplicates his world renowned process for unlocking the potential of the brain. Encourage integrated learning: The use of strong imagery, keywords and topic interlinking supports visual, linguistic, logical and auditory learning, while the activity involved in producing Mind Maps strengthens kinaesthetic learning. Engage students: iMindMap generates an interactive approach to learning, encouraging students to be more receptive and co-operative in the classroom, and can make lessons more spontaneous, creative and enjoyable. Supports teachers and saves valuable time: Benefit from increased efficiency and organisation through lesson planning, preparation and delivery and student assessment. Assists students with learning difficulties: Helps free students from semantic restrictions, allowing for more natural, complete and accelerated self-expression. I am a teacher and I am developing a ‘Mind Map’ club to enable children to use Mind Mapping as a tool for learning. As I am using what I consider to be the best software for Mind Mapping the children at school are reaping its benefits. Last June I was diagnosed with dyslexia … iMindMap really helped me. I saw my grades go up and feel more confident in my abilities. The results I achieved using iMindMap were fantastic and it was so easy to use. The software assisted me with my revision for my GCSE mock examinations. By the end of Year 10 I had achieved a D and E grade in Geography and History. In my mocks, after using iMindMap for my revision, I achieved A grades in both! I am terrible note maker, I tend to read a text and end up copying the whole text into my notes which is why Mind Mapping is ideal for me…you can only have keywords on the branches and not reams of text. iMindMap has enabled me to reduce my notes by about 95% quickly and with visually pleasing results. For more information about Dilwyn Owen’s school, visit the Ysgol Bro Morgannwg website.